If you are reading this Revelation on the day of its issue, then I am en route to Silver Mountain, Idaho to assess the state of affairs in the 2018/19 Alpine boot market. The occasion is Masterfit’s America’s Best Bootfitters annual Boot Test, the most respected, most authoritative and most widely disseminated exploration of what will be available to skiers next fall. As someone who has conducted or contributed to equipment tests for over three decades, I can reveal that everybody wants to test skis, but nobody normal wants to test boots. It’s hard enough to get one pair of boots to fit comfortably. Switching boots every few runs sounds likely to induce insanity, catatonia, or whatever other defense the mind can concoct to block out the white-light spasms of pain. While it may require a sub-genre of masochism to relish the prospect of skiing 30 new boots in succession, there’s so much to be learned from the exercise that a bit of discomfort here or there is easy to overlook. If all you ever did was consume catalog copy and don the boots indoors, you’d notice a considerable number of common traits within each category. Boots have to be experienced on snow for the nuances that distinguish each model to be revealed. In other words, current Alpine boot designs, particularly the preponderance of the market that uses a two-piece, 4-buckle chassis, are transparently similar yet remarkably different. You could make an argument that the purpose of the Alpine boot is to put the skier in this forward-biased position and hold him or her there through thick or thin. The strong rear support of the modern, above-the-ankle boot also allows the skier to apply rearward pressure without losing balance and enables swift recovery to a centered stance. Recently, whilst pondering the evolution of the Alpine boot and how the current market came to be, a friend gifted me an old volume of ski instruction tips. As I flipped through the pages, I was struck not by how different everything was back then, but by the similarities to today’s technique. 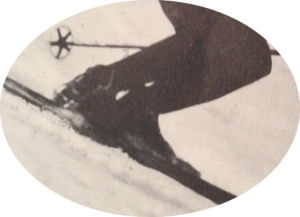 Just like today, expert skiers then had to maintain pressure into the front of their boots, only without the crutch of modern design to assist in creating and sustaining the necessary ankle flex. The modern Alpine boot helps define the stance that this famous skier assumes naturally in his leather boots. Note the high degree of ankle ROM. Another commonality among current boot designs is that they tend to be simple, straightforward shells and cuffs. There are a few discrete ways to tinker with flex and/or cuff position, but for the most part they are not laden with adjustable do-dads. In fact, like women’s swimwear, the more you pay for, the less you get. Race boots are bare bones affairs where precision and accuracy rule at comfort’s expense. This less-is-more attitude has been reinforced by the ascendance of the most significant influence on current Alpine boot design, the Alpine Touring market. The requirement for lighter weight in all aspects of AT boot design has infiltrated the 2019 market in the guise of new models from Head, Salomon, Atomic and K2. Consumers can expect lightweight design to remain a design focus for the foreseeable future. So I’m off to northern Idaho to evaluate the bona fides of the current crop of Alpine boots by the only method that matters: I, alongside 30 other stalwart souls, am going to ski them. Boots are no doubt the most vexing piece of equipment and just as certainly the most important. I can hardly wait to try the lot of them.